Esberitox®1 / 200 chew tabs - Nature's Way®. Take 6 tablets three times daily initially for faster results. Reduce to 4 tablets three times daily as you begin to feel better. Adults: 4-6 tablets, 3 times daily. Children over 12 years: 4-6 tablets, 3 times daily. Age 7-11: 2-3 tablets, 3 times daily. Age 4-6: 1-2 tablets, 3 times daily. CAUTION: Not recommended for individuals with autoimmune diseases, HIV infection, progressive systemic disease, or who are allergic to echinacea or other flowers of the same Compositae (Asteraceae) family, or any of the other ingredients of Esberitox, or who are taking cytostatic or immunosuppressive therapy. If pregnant, nursing or taking any medications, consult a healthcare professional before use. Hypersensitivity or gastrointestinal discomfort may occur. If you observe these or other side effects, discontinue use and consult a healthcare professional. Is there any casein in Esberitox® Supercharged Echinacea? Esberitox® Supercharged Echinacea contains lactose (a milk sugar) from milk. Casein is a milk protein. Although we do not believe that any casein is present in the product, we have never tested it to confirm it is 100% casein-free. Therefore, we recommend that customers who are extremely sensitive to casein to talk to their healthcare practitioner prior to taking this product. Is Esberitox® Supercharged Echinacea effective for children? Yes, Esberitox has been clinically shown to boost the immune function in children as young as age 2. * Esberitox is a chewable tablet, which makes it easy for children to take. 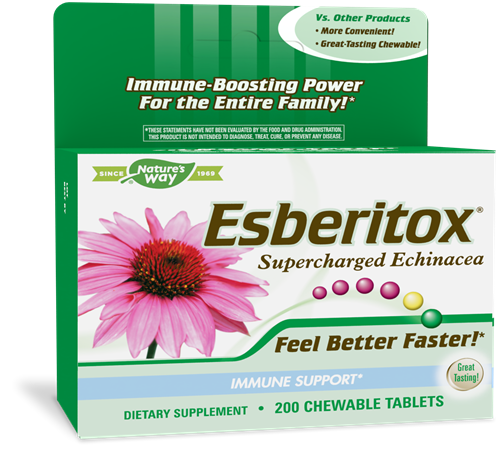 Can I take Esberitox® Supercharged Echinacea long term as part of my daily supplement regimen?